I put together a LoggerPro file that I use to demonstrate linearization. 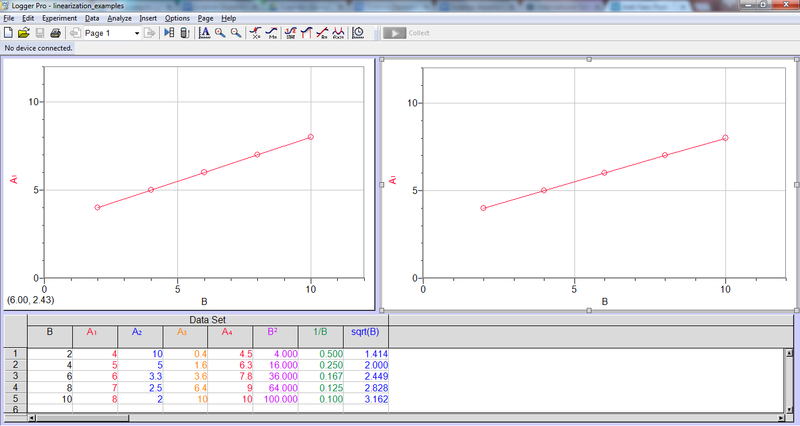 I choose a set of data to plot in the left graph, and then select the matching linearization for the right graph. I think this works better than a prescription approach because (a) it’s visual, (b) it’s in the same software the students use, and (c) I can demonstrate a few LoggerPro tricks (changing axes, autoscale, linear trendline) that are pretty useful. Here it is, in case you’d like to use it. This entry was posted in Uncategorized on September 9, 2015 by Danny. Sketching Functions — What’s Important? Hi, I’m Danny. I’m an internationally-minded scientist, artist, and teacher. You can find out more on my website.